A few small updates before our next Unsung Symphonies spotlighted work. *In the short time we've been up, we've apparently inspired another music blog! 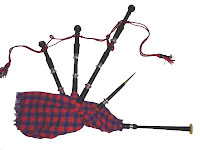 Check out Jake's smooth atonal sound blog over at Wordpress. 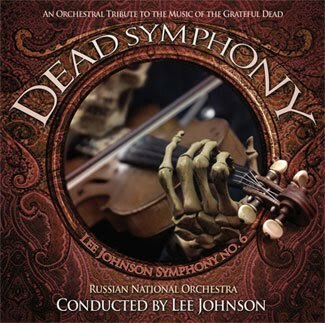 His first entry is The Dead Symphony, or, the Orchestral Tribute to the Grateful Dead. 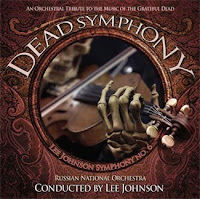 He takes Matt's post on Lee Johnson's work as a jumping off point for some probing insights into the issues facing a composer/arranger who wishes to capture the spirit of non-classical music in an orchestral, through-composed medium. He's also got an enthusiastic entry up on Kaija Saariaho, a must-read for anyone interested in the possibilities of orchestral color and form in the 21st century. Saariaho, as far as I'm aware, hasn't tackled the genre of the symphony (yet) -- our blog's definite loss! But until she does, we still have plenty of great, unjustly obscure Finnish symphony composers other than Sibelius to introduce here. We look forward to seeing where Jake, our comrade-in-Lebowski-references, takes his blog, so swing by smooth atonal sound today! *Head on over to Classical Music Library, whose biweekly free recording is an unsung symphony for sure, Sir Hubert Parry's Third Symphony in C! A vigorous, enjoyable work, with a surprisingly haunting slow movement. Give it a listen and see if you think it is deserving of the moniker "English Symphony." *So you wanna be Beethoven? Interested in writing the Great 21st Century Symphony? Wikihow, that indispensable web resource for completely non-authoritative advice on everything from the life-changing to the unimaginably banal, has just what you need: How to write a symphony! But, heed the wiki authors' warning: "Writing music can be very time consuming. It can often be very frustrating as well." We offer a warning as well -- if you're truly in the process of composing a symphony, you'll probably find the above internet advice about as useful as this. 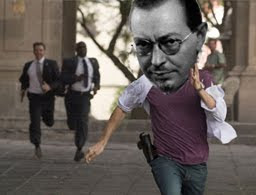 *Stay tuned for a new entry this week from Frank on Howard Hanson's Sixth! Today, three (and a half) symphonies for the price of one. One from Finn, Einojuhani Rautavaara, another from an American, Gloria Coates, and a half from Henri Dutilleux, a Frenchman. On the face of it, these are some pretty strange bedfellows (all they seem to share at first is being fairly prominent living composers), so the fact that each has a symphonic work inspired by the art and life of Vincent Van Gogh is probably coincidental. But a happy coincidence for Unsung Symphonies, since we can see how composers of very different temperaments engage similar(ish) subject matter. One technique that Rautavaara and Coates (not so much Dutilleux) frequently use is the blurring of a clear melody with lots of surface dissonance, setting it against other layers of unrelated, constantly fluctuating material. The results can vary from a quiet shimmer that leaves the underlying melody undisturbed to a tune whose outline is nearly erased by a dense haze of other activity. Boundaries blurred, shapes distorted, surfaces and backgrounds always squirming -- we could just as well be talking about Van Gogh's painting technique as modern musical procedures here. 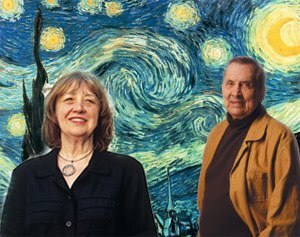 Rautavaara's Sixth Symphony: "Vincentiana" (1992) draws a considerable amount of its material from the composer's opera Vincent (1990), a heavily symbolic, non-linear collage of the life and mind of Van Gogh with libretto penned (like all of Rautavaara's 8 operas) by the composer. The symphony is divided into the traditional four movements (like all of Rautavaara's 8 symphonies, save the strange Fifth), each one with a subtitle alluding to an image or idea from the opera. This is the only of his symphonies to feature electronics, which are most prominent at the edges of movements, the orchestra typically filling up the space in between. Meandering quasi-tonal rhapsodies (that as a Rautavaara listener, you either come to love or hate) are freely mixed with passages of extreme atonal/12-tone violence throughout the work, though some of those rows also contribute to the consonant triadic material as well, a Rautavaarian trick. Among the highlights of the symphony is the combination of synthesizers and orchestral effects that kick off the work's first movement "Starry Night," a delirious waltz that seems to detonate towards the end of the third movement "Saint-Rémy" (Van Gogh's late life sanitarium), and exultant finale for the last movement "Apotheosis." The second movement, "The Crows," features a haunted refrain, ostensibly drawn from the opera's second act, where Van Gogh, in the company of Gauguin and his brother Theo, experiences a vision of fields "heaving, breaking in waves...writhing like big animals in their death-throes." Squint your ears for the almost inaudible string-section fuzz that blows over the slow chordal theme. This slight blur becomes an impenetrable smear with the tail end of the Sanitarium waltz, which buckles, then gives way to a blast of electronics and wind-mouthpieces, transmuting some nagging chorus of physicians and art critics into a murder of displeased corvids. Things do come together in the final "Apotheosis," which stems from music written for Vincent's final, triumphal/suicidal paean to light: "The day of the sun! And he who dies today shall never disappear, but will join those who once had the courage to go on and live!" Even here, Rautavaara's characteristically dense orchestration creates a blurry sort of sensory overload. Even more prolific a living symphonist than Rautavaara is Gloria Coates, an American ex-pat composer living in Germany who has 15 symphonies under her belt. Prior to her Seventh, they had non-symphonic titles, and were only dubbed "symphony no. x" substantially after the fact; eventually, Coates seems to have overcome her own discomfort with attaching what she calls such "a little name" to her earlier orchestral essays. Coates' style is intense and difficult, highly dissonant and devoid of much anything that could be called ingratiating. But her music is also clear and tightly balanced. A hallmark is the highly expressive, almost compulsive use of glissandi in all corners of her works. Her 9th Symphony, "The Quinces Quandary" (1992-93) is a sonic expansion of a work for chamber orchestra from the same year, "Homage to Van Gogh." Both are inspired by Van Gogh's late painting "The Quinces," created in the last year of his life. As far as I can tell the two pieces are the same but for thinner orchestration in the former, although the CPO Recording of the work, which is clearly for huge orchestra, labels the track "Homage." Nevertheless, I present this clip, which conveys a representative sample of this imposing 23 minute work - one of the huge waves of glissandi - with the assumption that it is the symphony we're hearing (it sure sounds like a massive orchestra). Coates' glissandi are apt metaphors for Van Gogh's late style. Her unending stream of sliding notes, restless and defiant of the boundaries of discrete pitch (and those of discrete event as well) are quite intentional musical analogues of the pulsating, unstable motion that undermines any "still life" in "The Quinces." The piece's continuous form is hard to pin down; this owes partly to Coates choice to eschew a prefabricated musical container, using the visual experience of gradually exploring the painting, allowing one's eye to train from one corner of the frame to the other, to guide her own pen. Like Rautavaara's Vincentiana, the Quinces does manage to fasten onto something something comparatively solid and "thematic" at its conclusion, a stony dirge of brass chords (by far the most tonal thing heard yet) jutting against the ever-present glissandi. The "Quandary" in the title alludes to something deeper, and more troubling, than a simple visual puzzle raised by the painting. While it was possible to take aesthetic-mystical flight in Rautavaara's Sixth, Coates' The Quinces Quandary allows no escape from the gloomy isolation of Van Gogh's world. If these are musically-represented decorative fruits, they are the most despondent fruits to ever grace a kitchen table. Take that oranges and pears! One last Van Gogh work. Although not a symphony in name, and not really even a symphony-in-all-but-name, I'd be remiss if I left out Dutilleux's Timbres, Espace, Mouvement (1978), whose subtitle "Starry Night" betrays inspiration again from that most famous of Van Gogh's paintings. Timbres, like most of Dutilleux's small output, is music honed to an almost ridiculous polish, with every pitch, every orchestral pairing bearing the imprint of a calculating perfectionist. You really can't go wrong with Dutilleux and this piece is a little marvel. After printing this, I discovered yet another Van Gogh inspired symphony, the 6th Symphony of Russian composer Alla Pavlova. Highly accessible, and perhaps a little trite, Pavlova's 6th exists in a kind of halfway point between lyrical neo-Romantic chromaticism and repetitive minimalist figurations. Much of Pavlova's sixth symphony seems geared towards an ever spinning cycle of dark, twisting modulations based on unusual triad relationships. Her orchestration is clear (featuring some viscous solo violin writing) but somewhat unvaried -- certainly, she resists the temptation to make experimental *timbre* the key in representing Van Gogh musically. 2. Quoted from "A Symphonist Stakes Her Claim," Interview and Feature with Gloria Coates by Kyle Gann, New York Times Apr 25/1999.